Topics: Get A Quote, and Asap Stock Assurance Plan. 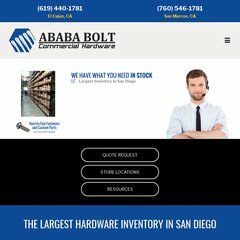 ababaqa.com Product Lines - Ababa Bolt - BOLTS, Fasteners, Screws, Nuts, for ..
ababaqa.com Locations - Ababa Bolt - BOLTS, Fasteners, Screws, Nuts, for Wood ..
Its local IP address is 66.175.58.9. It has 3 DNS records, dns1.earthlink.net, dns3.earthlink.net, and dns2.earthlink.net. It is hosted by Cedant Web Hosting (California, Davis,) using Apache web server.